Do you own dolls with different skin tones? I personally believe a lot of different skin tones add some flavor to a collection, and I would love even more versions of especially tan. Normal skin is also lovely, but there’s just something about tan dolls. Maybe it’s because I have a hard time getting tan myself (more prone to just getting burned), as it seems a lot of us live out our dreams through our dolls? At least I know I tend to. I can’t be an Elvish girl or have awesome multicolored hair or be mentally healthy, but hey, at least my dolls can! And they can be tan too, haha. Would you ever sell one of your BJDs? That’s an easy one. Yes, I would – in fact I’ve already done so. If I don’t enjoy the doll, I see no reason to keep it – even if it was my first BJD (a PukiPuki). I have to really love to photograph my dolls or at least love thinking about them (these days I don’t have the time to enjoy them much, but I do spend a lot of time thinking about them) to justify the cost of them. When I don’t enjoy a doll, I don’t really see why I should keep it around. I don’t bond heavily if I don’t like photographing, so most dolls I haven’t really missed. The only doll I actually really miss is one of my Pullips (a Pullip Papin), who obviously is not a BJD… Sometimes I actually think about getting another Pullip, because they are so beautiful. I think it’s just a bit of nostalgia when seeing other people’s really pampered Pullips, but I sort of envy those who do really great things with them. So, would you sell one of your dolls, or do you love them too much? Have you maybe already sold some? How do you bond with your dolls? Do you bond at all or do you just marvel at their beauty? Well, it’s a bit of both, I think. I didn’t bond at all with my MiniFee Chloe, Molly; as in I didn’t want to take pictures of her. For me it’s a lot about wanting to take photos of my girls, as that and blogging are my favorite things in this hobby (other than making awesome friends and spending an afternoon at Starbucks with them!). So while I may not bond as I’ve heard other collectors describe it, I still feel like I bond with my girls. I usually just know when it’s wrong, like Molly. Others I am more unsure of, like Cassie. I want to reshell her in a LittleFee body, though. (Hopefully a tan one.) She’s very beautiful, but she can’t do the things I want her to. And I know when it’s just right, like with Nova. I want to drag her to places with me, so yes…that’s bonding in my world. I’m trying to bond with my LittleFees in the same way, but I think Lati Yellows will always be my favorite size! Have you ever ordered something and it either didn’t fit or just wasn’t what you expected? Does a MiniFee count? In all seriousness, I bought so much stuff for Molly, my MiniFee Chloe. I got her many hands, a pair of heeled feet, a custom face-up, tons of clothing and shoes (especially the shoes were hard to obtain)…only to realise that I had no clue what to do with such a big doll. I didn’t feel like bringing her anywhere. I didn’t feel like photographing her in my apartment. I never brought her to a single meet. The list goes on… She has now been sold and is in her box in my closet waiting to be shipped to her new owner alongside with a huge chunk of her clothing. To this day I still hate myself for spending so much money on her and on stuff for her, and it has made me vary of purchasing too many things for a doll until it is here, and I know that it’ll stay. I have purchased 1 kimono for Rain and no shoes. (Which reminds me of that Taobao order I still need to do…) I have ordered a dress for Kiri from one of my very talented friends here in Denmark, Delusions-in-glass/Noam. He did the most amazing dress for his boy, Liam, which prompted me to ask if he’d take a commission from me with a pretty big amount of freedom. He agreed, and I’ve seen some pretty nice sketches so far…now he just needs to get a big amount of flowers home, haha! As for clothes and items for dolls I’ve mainly been happy with what I’ve gotten for all my girls. I tend to be very picky, but the result is a small amount of very nice clothes – I have been very lucky with that! So, have you have big regrets like me, or has your unfortunate buys been smaller things? Or have you had no unfortunate buys? How many dolls do you own? Do you have a max limit (or have you already exceeded this)? Own? Well, I’ve got 3 full dolls at home (out of which 2 are for sale) plus 1 body… (Technically Molly is here, too, but she has already been sold!) And I’ve got 2 faceplates and a full LittleFee coming in and 3 Latis coming in… So I guess I’ll have like 6 dolls and 1 faceplate to stay and 2 dolls for sale? I need to stop making my dolly collection so complicated! Hopefully I can sell off Cassie’s current Momocolor shell soon plus maybe Siria… I feel like 4 Latis are quite enough to form a Lati army! (Unless they release a pink Lati. I would need that.) Then I’ll need to reshell Cassie (maybe LittleFee Chloe?) and get a body for the extra faceplate (LittleFee Juri 13) plus maybe an extra LittleFee character I have been trying to work with. But the reshelling, the extra body and the extra LittleFee are all something that will come at a later point, since I don’t have the funds right now. Crossing my fingers for a job to open up soon! So I guess my max limit currently is at 10 dolls or so? I don’t like to set a limit, because I know a lot of people set a limit and then feel bad for breaking it. On the other hand I don’t want too big a collection, since I don’t feel like I’ll have the time for my dolls then. How many dolls do you have? Is your collection as chaotic as mine? Do you like to keep a limit? Have you ever had people tell you that they are creepy? Have you ever been creeped out? My significant other finds a lot of dolls to be rather creepy – that’s why I show him dolls before I even start dreaming of owning them. I don’t want to bring dolls into the house that he finds genuinely creepy, because I’d hate if he started bringing pet spiders home. It’s all a matter of respecting the other person’s boundaries. Have I ever been creeped out? Heck yeah! Some of these dolls made to look like real babies really scare me. Well, babies in general scare me, but the dolls are just creepily realistic. Wax dolls like those in Madame Tussauds really freak me out too. They just stand there looking like real people but with dead eyes. 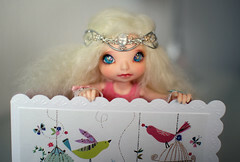 BJDs have more life in their eyes than wax dolls! Plus a friend of mine posted this in a BJD group on Facebook recently. *points to the left* I don’t know where she has it from, but that empty stare haunts me in my sleep. Pretty glad I don’t have to live with that! Are you also creeped out by specific types of dolls like wax dolls, or are you just an all around doll lover nomatter form or type? Is there a particular size that you cling to? Which one and why? I don’t try to, I honestly don’t. Some days I don’t even know why I have so many Latis (2 at home, 2 on their way, hoping for at least 1 more), but then I spend a little time with one of them or look at pictures of them, and I remember why. They’re a very uncomplicated form of happiness for me. They don’t have complicated characters or big schemes – they’re children and they’re happy (well, mostly). And I look at other people (especially those with far bigger Lati armies) and I know that I’m not the only one feeling this way. You can’t own just one Lati, they multiply. And because of their size it doesn’t feel so overwhelming (their price is another story…). Don’t get me wrong, I also like PukiFees and other dolls this size, but Latis hold a special magic for me. I think my collection could just consist of them and I wouldn’t mind. I also really like YoSD, I think. I didn’t spend a lot of time with my LittleFee Reni before I sold her faceplate, but it was fun. I think it’s a really great size for me, especially since even Momo29 feels a bit too big for me. I’m excited to explore the size, that’s for sure. So, are you a Lati hoarder like me? Do you prefer big SDs because of their adult beauty and elegance? MSDs because of their young, yet adult energy? Or do you want to collect them all?